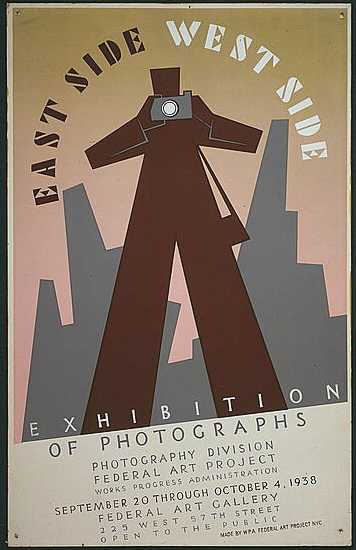 Title: East side West side - exhibition of photographs Photography Division, Federal Art Project, Works Progress Administration, September 20 through October 4, 1938, Federal Art Gallery 125 West 57th Street. Date Created/Published: NYC : WPA Federal Art Project, 1938. Medium: 1 print : silkscreen, color. Summary: Cover illustration for photography exhibition catalog showing man taking photograph and New York City skyline in the background.